Dr. Rajesh Ahlawat is Chairman at Department of Urology and Renal Transplantation, Fortis Hospital, Delhi. With an experience of 41 years, he practices at Medant- Mediclinic Defence Colony, Delhi. The Best Urology surgeon in India has worked at leading Institutions of North India and has established successful Minimally Invasive Urology programs including Robotic surgery and Kidney Transplant services with excellent outcomes comparable to the best in the world. Contact the Top Urology surgeon in Delhi by sending your query to Dr. Rajesh Ahlawat Email-id. Get Urology Surgeon Dr. Rajesh Ahlawat Appointment. 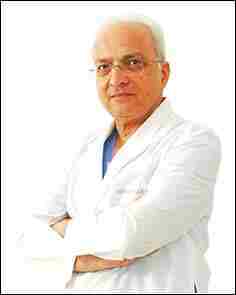 He has initiated and established four successful Urology and Renal Transplant Programs in India. He has the spearheaded the busiest Minimally Invasive Urology services in India at his workplaces. An accomplished minimally invasive surgeon, he has been invited as a guest faculty for live demonstratin of variety of laparoscopic and robotic surgeries such like Pyeloplasty, Radical Prostatectomy, Partial Nephrectomy, Kidney Transplantation surgeries and Radical Cystectomy at live surgery workshops held around the globe. Fix a quick appointment with Best Renal transplantation surgeon in Delhi India via Dr. Rajesh Ahlawat Phone Number. The Robotic Renal Transplant specialist in Delhi has pioneered the world’s first Robotic Kidney Transplant (RKT) with regional Hypothermia technique in collaboration with Prof. Mani Menon’s team from Vattikutti Urology Institute (VUI) at Henry Ford Hospital, Detroit, USA. He is working as Director at VUI International to spread the robotic technique around the world. Call Dr. Rajesh Ahlawat Urologist Fortis Hospital Contact number given on our website. The department of Kidney and Urology Institute at Fortis Hospital is a centre of excellence for those with diseases of the urinary system including the bladder, kidneys and the prostate gland. Our finest experts work together to deliver the highest level patient care with best clinical outcome. Request a quick appointment with Dr. Rajesh Ahlawat Urology surgeon at Fortis Delhi. Dr. Rajesh Ahlawat, Head of Urology surgery at Fortis Hospital Delhi talks about new prospects in Urology and disease management.